Phil Fersht: David, you asserted that providers today need to be really strong in both BPO and technology, rather than dabbling in one or the other. I’ve looked very closely at a lot of the Indian ITOs. They like BPO because it has a huge IT tail on it and they’ll even bid on small BPO deals because they see the IT opportunity. But the mindset required to lead a BPO engagement is very different than what is needed to lead an ITO engagement. Do you think we’re going to see a consolidation in the industry between the BPO and ITO sides? Or do you think it’s going to meander for a little while longer while everyone figures this thing out? David Andrews: I think you’ll see a lot of meandering around, and denial, from either angle because we’re all prisoners of our heritage. But I think you’re going to see one or two get it. And those are the ones that realize BPO has got to be technology powered. Phil Fersht: Do you still see this as a very industry-centric business, or do you think we’re getting to a stage now where industry spin "sells", but it is really about operations and delivery? David Andrews: I’ve always been industry agnostic. When I was at Accenture, functionally I was an expert in systems building, but knew nothing about stock exchanges when I went to build the London Stock Exchange system. You’ve got to be able to operate in an industry, but if you focus on only a couple of industry perspectives you are often bound by tradition and what people historically have found possible. And I think that really applies to BPO. BPO is all about being a great operator of processes, and those processes can be standardized across industries as well as within a company. So, for example, Cayman’s processing and the sorts of things you need to do there can be similar in insurance and financial services and telco customer billing, as it’s all transfer of money. It’s really all about reinvention, and I don’t think you get reinvention by being an industry expert. By knowing a tremendous amount about a particular industry you are almost a prisoner of it. That’s not to say it’s not important knowledge, but if you’re going to cause reinvention you have to come in with some new ideas. So in 4G cloud computing – a new idea – you don’t have to be an industry expert but you have to be an expert in how to apply it to an industry. Phil Fersht: One of the things I am grappling with, is who is going to be leading BPO deals from the vendor-side. In the early model, Accenture and PwC started off with BPO services that formed a platform for their consulting businesses. Now we have companies like Genpact which are trying to incorporate transformational support as a standard practice within BPO. But when we get into more of these synergized technology-driven BPO engagements – how are these going to come together from a delivery perspective? I spent a lot of time recently with the SaaS companies and software thought leaders and many of them still have the attitude that they can come and slam in a SaaS application, and the customer should just be able to figure it all out and run it itself. But BPO guys like you and me know companies need a lot more help and support in getting there. So who is going to be leading these deals down the road? Is it going to be the BPOs or do you think it is going to be the technology-led companies that develop more comprehensive BPO skill sets? David Andrews: I think it is going to be the companies that understand how to build market infrastructures that take advantage of economies of scale which enable them to invest in reinventing – I think that’s the combination. That is why I am so excited about Xchanging’s future because I think we’ve mastered the art of - or we’ve understood - the power of market infrastructures and put them into a commercial context, and realized you’ve got to power that with technology. You can do the process optimization, you can do your arbitrage and all that stuff, but you’ve also got to be really creative in the ways in which you apply technology, and be prepared and courageous enough to cannibalize what you have in order to move to that brave new world. I don’t think there are very many of us out there doing that, but there is the opportunity over the next five to 10 years to build the next IBM or Accenture. In my view, some companies will master this and become very big corporations. I think you could well argue that Xchanging has got what it takes to become a lot bigger. I also think you could say Genpact has characteristics along those lines. You’ll find one or two of the big shared services boys will spin out. Then there will be a couple of surprises none of us have thought about. But I think there will be five or 10 out there. The advantage I think Xchanging and Genpact have today over pretty much everyone else is that we are pure play and genuinely global. So if you go into our centers you will see us exchanging work flows within a business day. So it’s not just a question of lift and shift – it’s lift and shift, lift and shift, lift and shift –shifting backwards and forwards all the time between our centers. And for that you must have a very strongly engineered standard environment. Phil Fersht: You made a very good point that some of these vendors are really going to get it, while some, simply, won’t. At HfS, we’ve started to look at two camps – the "innovators" and the "operators". While some vendors have high-growth, multi-billion dollar businesses, most of their client relationships are with the director of applications…they operate two or three layers down from the business decision-making. You know they are really struggling to get to the higher layers. Are these guys always going to be good "operators" because they are pretty much happy where they are, and make enough money doing what they are doing – and do you think they should start to be honest that that is what they do, versus "innovators" who generally are trying to operate at the higher levels of the organization, and drive more gain-share outcome initatives with their clients? We are starting to see some vendors step it up and try to become innovators, whereas you’ve got these operational companies who clearly aren’t investing heavily in the talent they need to do this. Do you think this dynamic is going to continue in this vein for a while? David Andrews: Interesting arm wrestle, isn’t it? Innovators will say that operators are boring. Operators will say that innovators are nut-cases. I think each of those is necessary but insufficient. I think the new sufficiency is that you need both. You need to be an innovative operator. Phil Fersht: We’re starting to hear from several experienced buy side BPO leaders that they’re beginning to invite more and more vendors into their mix in order to move away from the "single throat-to-choke" model, where they feel beholden to one vendor which hasn’t really stepped up to the task. They’re starting to look at bringing in some innovative type players to add more value. Do you think this is a sign of BPO maturation where buyers are now getting smarter and wanting to increase the competitive mix from their suppliers, or do you think we’ll stay with a one supplier model for quite a lot longer? David Andrews: I think to embrace multiple providers into the mix you need to be very organized with a really good framework for operating. So my guess is those companies that are talking in the way you suggest have already figured out how to operate a standard framework into which they can plug best in class, and they might decide they can’t invest enough to do best in class themselves. That’s certainly where we are going because we realize you can’t be good at everything. And therefore we have to bring it in to get the quality. This make versus buy decision…it’s a constant decision within our organization. Ideally you prefer to buy it from best in class. The areas in which it’s really happening at the moment are where you’re putting together quite innovative sets of processing and you probably have to add three or four products you’ve put together in order to deliver the outcome. So there’s quite a lot of assembly going on today, certainly in our organization. Maybe three or four years ago we were doing development, but we’re now assembling best in class. And of course there are a few companies you have to have a strategic relationship with because they dominate their particular environment. Phil Fersht: David - this conversation has been most interesting - and could go on for a while yet! Thanks for much for your time today - HfS readers will enjoy reading your thoughts. David Andrews: Thanks, Phil. Glad to spend time with your readership. 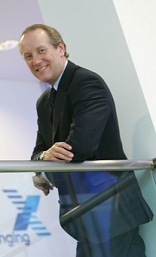 David Andrews (pictured above) is CEO Xchanging plc, founding the company in 1999. Previously, David built up Accenture’s outsourcing business and had responsibility for managing major technology replacement programmes in Europe. Before joining Accenture, he managed a major programme of hospital refurbishment and health care infrastructure renewal in Congo. Phil- great interview, thanks for sharing. Phil - thank you for sharing. I have a company that's in the process of consolidating both BPO and Technology. The results have been very encouraging so far.